You don't have to give up spaghetti, turkey sandwiches, or any of your favorite foods bundled with carbs because you have too much yeast in your system. 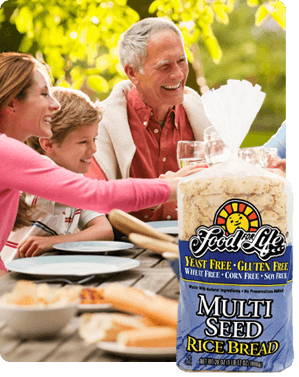 Helping you live a healthier, happier life without having to give up your favorite things is why we crafted a wide assortment of yeast-free breads, tortillas, pastas and cereals. So not only can you enjoy fettuccini alfredo for dinner, but you'll also be excited to know that everything about our yeast-free products are good for you. We bake in small batches – to ensure only the highest quality products leave our facilities. We use a unique cold baking process – Our yeast free breads are made using a unique cold leavening process which works with the naturally occurring yeast in the air to slowly and naturally help the bread rise. Delicious taste and texture – countless hours of research and development have gone into the creation of each and every delicious yeast free product that Food For Life bakes. We use no artificial anything – no GMOs, no artificial flavors or preservatives, no refined sugars, and no shortenings. Many of our yeast-free products are made with sprouted grains, which aid with lowering blood sugar, lowering cholesterol, and increasing digestion.